Buy our innovative at-home gym system. Visit our store. Change the way you exercise at home. Purchase our product. Wake up at the gym everyday when you buy our system. Some exclusive features were reviewed by an engineer who works on projects for NASA. Our product comes with a life-time warranty on all parts, and a three-year warranty on the resistance bands and tubes. As with ALL EXERCISE PROGRAMS, please review your exercise plans with your health-care professional, doctors and therapy experts prior to starting your workout with this product. Avoid this trip hazard. NOTE! Always tuck your resistance bands and resistance tubes under your mattress when not in use. The strapping material is made of seat-belt type webbing, professionally sewn (not glued) with hook and loop to secure the material to fit any size bed. Resting between your mattress and box-springs, the strapping has two stainless steel oval rings that were designed with the assistance of an engineer who produces products for NASA! The resistance tubing and bands come with your product, offering a variety of resistance strength for beginners and highly trained professionals. Let's face it. Though exercise is important, going to the gym is a hassle. Finding the right workout clothing, spending money on gas and memberships, and wasting time on transportation can distract anyone from getting the activity they need. At Platinum Point Publishing LLC, we understand this struggle, which is why we have created the at-home workout gear you have always wanted. Our durable and easy-to-install system is designed to slide between your mattress and your box springs and provides you with the resistance training you need to build, tone, and stay fit. The best part of all, it's ideal for both beginners and pros. You'll see results in just four weeks. Enjoy a safe and practical 20-minute workout to your favorite shows and music right in the comfort of your bedroom when you purchase today. There are dozens of exercises you can accomplish with this product. You can even back up a kitchen chair and simulate push-ups! This is the safest, most effective way to work out with resistance tubes and bands. "I work out at a gym and attend fitness classes 3 days a week. 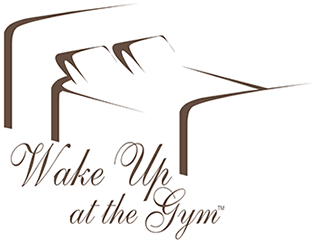 Using 'wake up at the gym' for the first time gave me more of a concentrated muscle burn than anything I've tried before. I was truely amazed. I have already told my friends and family about this wonderful product!"